There's a quick technique that has been researched and tested in the financial industry that helps provide a realistic gauge if you are on track for retirement. Let me introduce you to the 4% rule. Step #1: Calculate your total retirement savings (401k's, IRA's, Taxable Accounts, etc.) This is why you may need 24 hours to gather everything! Step #2: Multiply your total savings by 4%. Bingo. That's how much you can expect to have in retirement income if you retire in your 60's and live into your 90's. Approximately a 30-year retirement. Quick example: $250,000 in retirement savings would equal $10,000 per year (4%) in retirement income from your savings (not including social security or pensions). There's a lot that goes into the 4% rule. Read on to understand how to use it correctly. Simple math, if you start with $100,000 in total retirement savings and take 4% exactly each year, with no inflation or growth, you would receive $4,000 for 25 years. Easy to understand. If you did this, there are two things to be concerned about. Second, inflation would eat away at your purchasing power (i.e. that same gallon of gas goes up in price every year). Continuing on this scale year, your savings will deplete a lot faster than expected. I call inflation the silent killer. It takes your $100,000 nest egg and reduces it down from lasting 25 years to 18 years. That hurts. For those of you who take the "money under the mattress" approach to retirement, this is the reality you face. To keep up, you need your money to grow with inflation. Enter the concept of investing. The first question I usually get from a new retiree is, "I need to be more conservative with my investments as I don't have the time to make it back up." I would argue the stock market is not your biggest threat. Inflation is. And the stock market is actually your friend to beat it. Here's why. The example we have been using assumes your $100,000 nest egg is just sitting in cash. Let's change that to earning a 5% average rate of return. Keep in mind this is still getting a raise every year of 3% to keep pace with inflation. By letting the stock market be your friend, you have increase your years in retirement from 18 to 34. Not bad. Now you know the power of inflation and how investment growth can help you keep up. However the key words are average return. The examples above assume a perfect world. You very well may average 5% rate of return on your investments over your retirement years, but you will definitely not get exactly 5% each and every year. We need to take real world stock market volatility into consideration. Some years you may receive a lot higher than 5%. Others you may experience a significant loss. Your results will heavily depend on your real world investment results. Traditionally, the more aggressive you are, the longer your money may last as you are putting yourself in position to achieve rates well above 5%. If you are extremely conservative, the opposite will be true. When the financial industry began researching an appropriate withdraw rate, it started with various percentages. To start, it took a balanced portfolio, defined as a 60% stocks, 30% bonds, and 10% cash investment portfolio. It then tested this portfolio against actual stock market returns from 1926 to 2015 using various percentage withdraw rates. Disclosure: This example assumes a 90% probability rate using a portfolio of 60% stocks, 30% bonds and 10% cash. These hypothetical illustrations are based on rolling historical time period analysis and do not account for the effect of taxes, nor do they represent the performance of any Derive Wealth Portfolio or product, which will fluctuate. These illustrations use the historical rolling periods from 1926 to 2015 of stocks (as represented by an S&P 500 composite), bonds (as represented by a 20-year long-term government bond (50%) and a 20-year corporate bond (50%), and cash (as represented by U.S. 30-day T-bills) to determine how long a portfolio would have lasted given various withdrawal rates. A one-year rolling average is used to calculate performance of the 20-year bonds. Past performance is not a guarantee of future results. The S&P 500 Index is an unmanaged index of common stock performance. You cannot invest directly in an index. 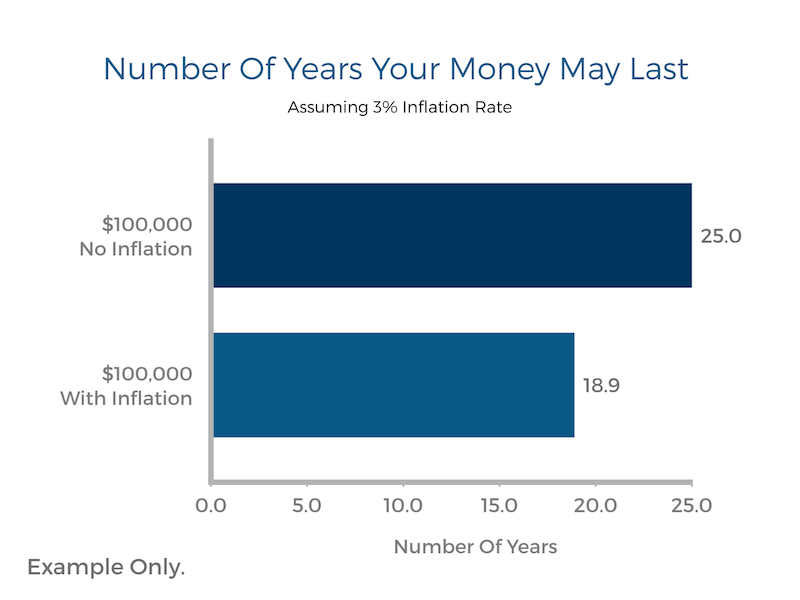 Looking at a 3% rate, your money has a good chance of lasting 50 years. Based on an average retirement age in the 60's, this level could take you to well over age 100. A little too conservative. Looking at a 5% rate, your money has a good chance of lasting 20 years. If you retired in your 60's, your money could last into your 80's. Not long enough in my opinion. Hence the 4% sweet spot. If you want to go beyond a quick analysis and take a deep dive, we can help. Our retirement analysis is designed to determine how long your money will last using 1,000 different combinations of inflation rates and rates of return. This is our way to combat an unknown future. Take a glance at how it works. It starts by looking at how much income you may need every year based on your personal goals. Lasty, and most importantly, we add in the 1,000 different real world scenarios. We randomize the rate of inflation and investment returns to see how your lifestyle and portfolio withdraws will hold up facing an unknown future. The results are based on a percentage basis from 0% to 100%. The closer to 100% you are, the more secure your retirement is. I like to say there is no dress rehearsal when it comes to your finances. Taking the time to know where you stand can mean the difference between staying retired or going back to work. Derive Wealth is an independent, 100% fee-only financial planning firm located in Pasadena, CA. We specialize in creating personal financial plans designed to organize your life, get you to your goals, and take the worry out of your money. We don't sell products and don't work on commissions. Instead, we provide financial advice you can believe in. Newer Post5 Lessons I've Learned By Working With "Millionaires Next Door"
Derive Wealth, LLC is a registered investment adviser offering advisory services in the State of California and other jurisdictions where exempted. Copyright 2019 Derive Wealth, All Rights Reserved. Any investment related discussion on this website is not an indication of past performance predicting future results. Any mention in indices are not available for direct investment. Diversification does not eliminate the risk of investment loss. There is no guarantee investment strategies will be successful. Information provided is for illustrative purposes only.